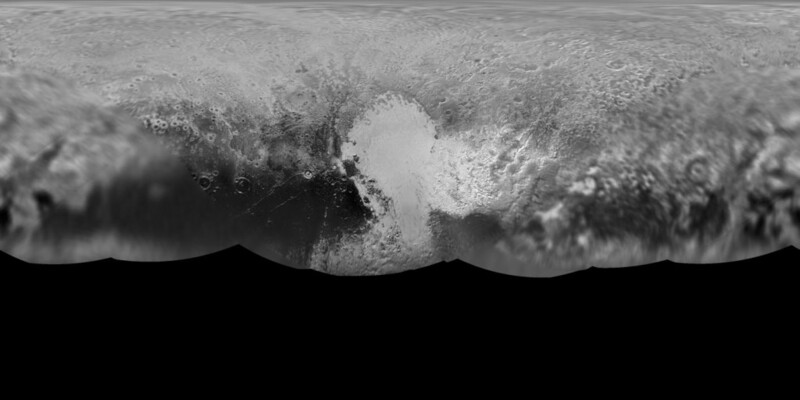 July 28, 2015 – The science team of NASA’s New Horizons mission has produced an updated global map of Pluto. The map includes all resolved images of the surface acquired between July 7-14, 2015, at pixel resolutions ranging from 40 kilometers (24 miles) on the Charon-facing hemisphere (left and right sides of the map) to 400 meters (1,250 feet) on the anti-Charon facing hemisphere (map center). Many additional images are expected in fall of 2015 and these will be used to complete the global map. The New Horizons spacecraft flew past Pluto and its moons on July 14. The Johns Hopkins University Applied Physics Laboratory in Laurel, Maryland, designed, built, and operates the New Horizons spacecraft, and manages the mission for NASA’s Science Mission Directorate. SwRI, based in San Antonio, leads the science team, payload operations and encounter science planning. New Horizons is part of the New Frontiers Program managed by NASA’s Marshall Space Flight Center in Huntsville, Alabama. Alan Stern, the principal investigator, is from Southwest Research Institute (SwRI) in Boulder. Many of the key mission scientists and engineers for New Horizons are also based in Colorado.